Thunder Sport Drake edition electric kit with main and tail blades. Goblin 570 Sport Drake edition with main and tail blades. Combo with SAB servos, competition motor, ESC and SAB blades. 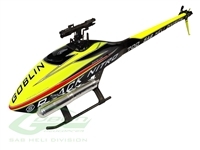 Havok edition 700, 3 blade rotor head, G10 frames, includes main and tail blades. 770 Sport kit with G10 frames, 750mm main blades and tail blades. Latest Goblin 570 Sport, G10 frames, main and tail blades. Nitro Sport kit only, G10 frames. Latest Goblin 500 Sport with G10 frames. Kit only. Combo with competition motor, ESC and SAB blades. Thunder Sport electric kit only, G10 frames. Basic Goblin 380 Kyle Stacy edition kit. Basic Goblin 380 kit (Carbon).